Some companies require their employees to provide an official medical note when they take a ‘sick day’. This Canadian doctor’s response is perfect. Note in Canada, the health-care system is publicly funded and all Canadians have access to universal coverage. If you find the text on the image above difficult to read, you can find a transcript below. An employee of your company visited my office/emergency room for the purpose of obtaining a medical note to satisfy your company’s absenteeism policy. This request is a non-insured service, not funded by Medical Services Insurance. As a business operator in Nova Scotia, I am asking for your support in helping to alleviate unnecessary pressure on the health-care system. I am hoping you will consider revisiting your current absenteeism policy and remove the requirement for your employees to obtain a medical note for missed time from work. This policy creates an unnecessary burden on the health-care system and also exposes seriously ill patients in my office to viruses that could cause detrimental consequences to their health. In most cases, the best remedy for a patient with an isolated illness (i.e., gastrointestinal virus or common cold) is to stay home, rest and drink fluids. Coming to a doctor’s office or an emergency room for a medical note does not complement their recovery. If, for whatever reason, your business decided to continue to require a physician to authorize their employees’ absenteeism, I will require your employee to bring with them a written request from the organization for the medical note. Upon providing the service I will invoice your company $30.00 per medical note. This is a standard practice when providing non-medical necessary services for third-party organizations. As Canadians we are lucky to have our health-care system, but the ability to access its services in a timely fashion is growing problem. Health-care providers, business operators, governments and individuals all have a role to play to ensure its sustainability. 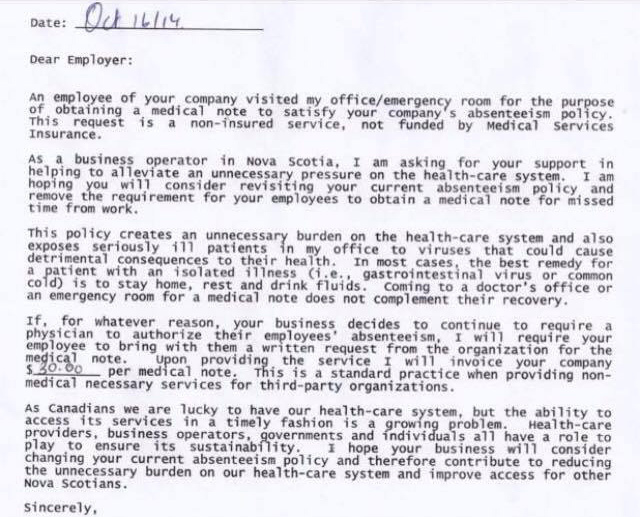 I hope your business will consider changing your current absenteeism policy and therefore contribute to reducing the unnecessary burden on our health-care system and improve access for other Nova Scotians. PreviousWhat Happens When the Majority of People Become Unemployable?